Just add dark clothing, cape or robe to complete costume. 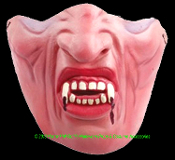 Great for Halloween Decoration, Mardi Gras Masquerade, Poker Game distraction or Trick Joke Gag Gift. *Also a terrific funny addition to a dummy or mannequin head for prop building!